Too many drivers today overestimate their abilities behind the wheel. They use commutes as time for multitasking – eating and drinking on the way to work, finishing last minute personal grooming, or sending emails and texts. According to the FCC, every day 8 people are killed and 1,161 are injured because of distracted driving. Most do not consider the dangers of distracted driving until it’s too late. 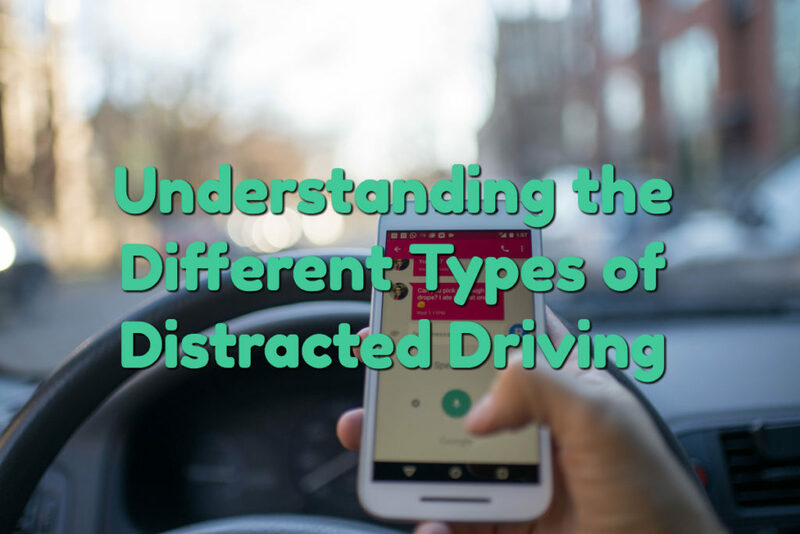 Learn the different types of distracted driving, the most common culprits, and how to avoid becoming a distracted driver. Visual distractions mean anything in the cab of the car or outside the car that draws the eyes away from the road. Many drivers mistakenly believe they can take their eyes off the road long enough to read a text, fiddle with the radio, unwrap fast food, or rubberneck a crash without losing control of their vehicles. This dangerous misconception has led to thousands of fatal accidents in the past. Roadside billboards, looking into rearview mirrors too long, or looking at a passenger as you chat can present dangerous visual distractions. If you’re prone to taking your eyes off the road, take some steps to change this behavior. Never assume you have time to look away from the road. Accidents happen in split seconds – often too fast to react to appropriately, even if the driver is paying strict attention. According to the NHTSA, reading one text message does the equivalent of driving across a football field going 55 miles per hour with your eyes closed. Keep this in mind next time you glance down at your phone while behind the wheel. Something presents a manual distraction if it requires the driver to take one or more hands away from the ten and two o’clock positions on the steering wheel. Holding the steering wheel correctly is important for being able to react to changing roadway situations and successful maneuvering. If another car merges into your lane or a pedestrian steps out in front of you, having both hands on the wheel can help you to prevent a collision. If your hands are changing the radio station, typing a text, scrolling through social media, or gripping a hamburger or cup of coffee, they aren’t on the wheel prepared to steer. California has strict cell phone laws in place to help prevent distraction-related accidents. Holding a cell phone or other hand-held electronic device while driving is against the law and can come with fines of up to $170. Drivers can avoid manual distractions by never eating or drinking in the car, turning off distracting mobile devices, using talk-activated systems to control things like phone calls or the radio, using Bluetooth headphones to chat, and saving personal grooming tasks for once you’re out of the car. Lesser-known types of driver distraction can impact driving even with both hands on the wheel and eyes on the road. Cognitive distractions are anything that takes the driver’s mind away from the driving activity. This could be thinking about a conversation, feeling drowsy, letting thoughts wander, daydreaming, listening to the radio, talking with a passenger, or feeling too emotional to safely drive. Drivers need to focus 100% of their mental energy and attention on the roadway. Eliminate these distractions by keeping the peace with passengers, pulling over if you need to think heavily about something, and avoiding talking on the phone while you drive. In 2015, the National Highway Traffic Safety Administration reported that 3,477 people unnecessarily died because of distracted driving in the U.S. In conclusion, if we don’t take the initiative to ignore the driving distractions and practice safety on the roadways, we will continue to see an increase in fatalities. It’s important to understand exactly how people are distracted in their vehicle, and why it’s a safety issue, so you can work to stop the distractions and get to your destination safely.